This heavy-duty appliance truck has kickback wheels for support and moves large equipment with ease. 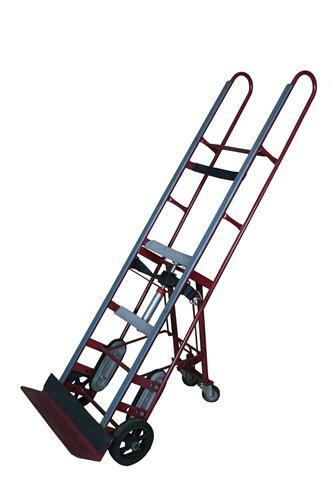 Great stair climbing ability and an auto-rewind ratchet tightener for maximum load security. The 24” x 5” noseplate allows items to be loaded, carried and unloaded safely and the handle allows you to properly hold and balance the truck. Rolls smoothly on aluminum-center rubberized wheels and has two retractable casters to support bulky and heavier loads. This Appliance Dolly is an essential tool in moving large objects such as appliances, furniture, and heavy boxes. Perfect for anyone planning on doing heavy lifting or frequent moving.